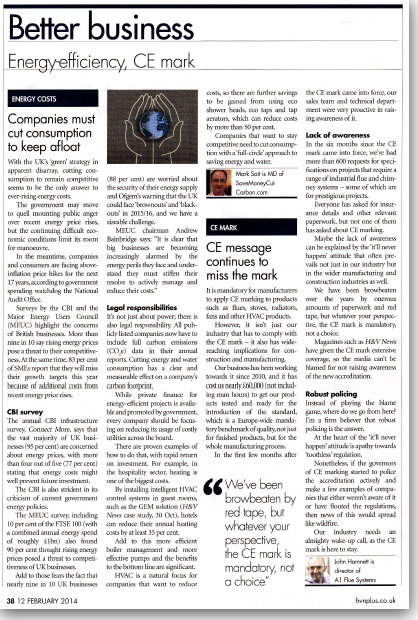 Mark Sait, MD SaveMoneyCutCarbon is featured in H&V News with “Better Business” guidance on energy savings. “Every company should be focusing on reducing its usage of costly utilities across the board. There are proven examples of how to do that, with rapid return on investment. For example, in the hospitality sector, heating is one of the biggest costs. H&V News is the leading publication for the building services sector. With the industry involved in the most wide-ranging changes in its history, including the adoption of renewable energy technologies, updated and new legislation and issues surrounding government incentives, while also dealing with the impact of changing economic conditions, the need for accurate information has never been greater. Call us on 0845 123 5464 to discuss your energy saving business needs and start saving now.